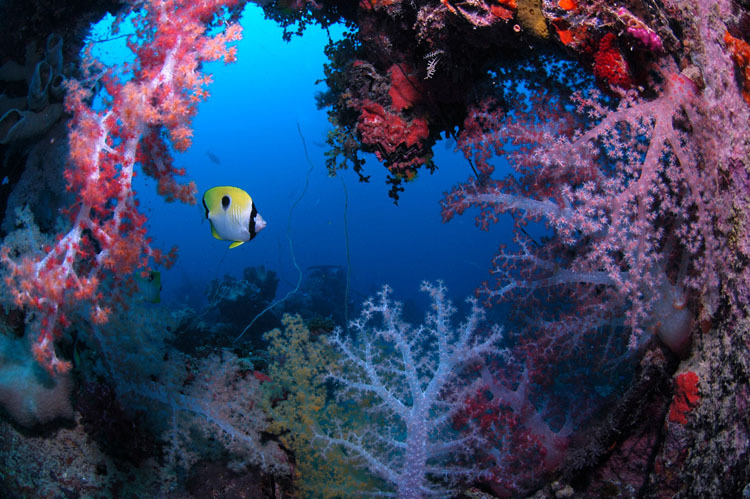 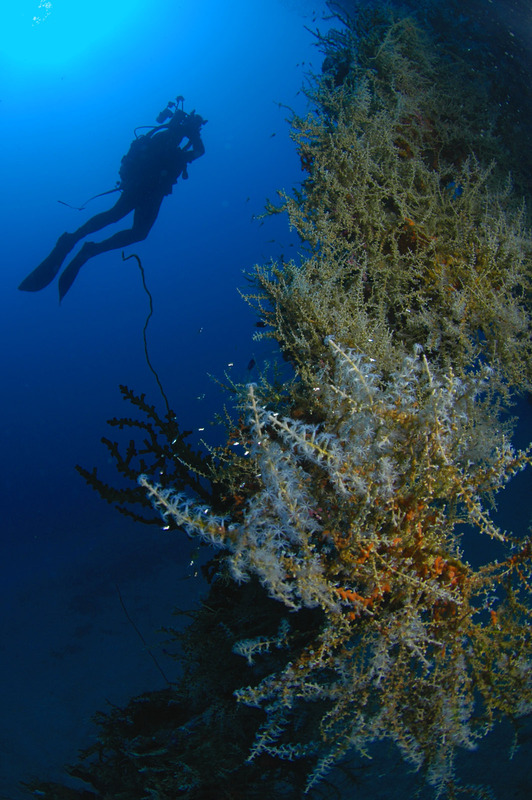 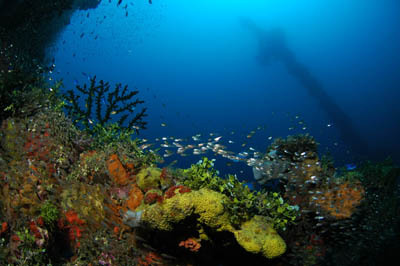 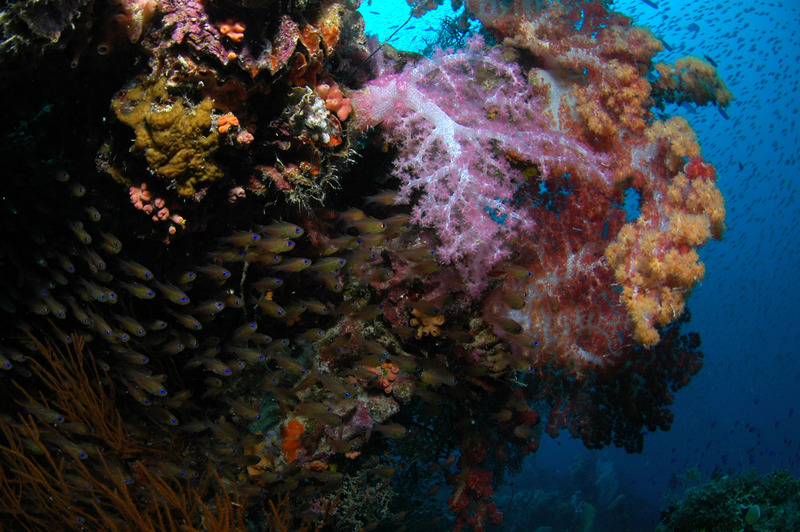 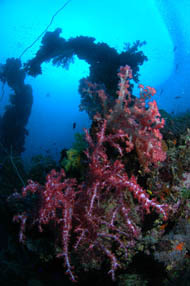 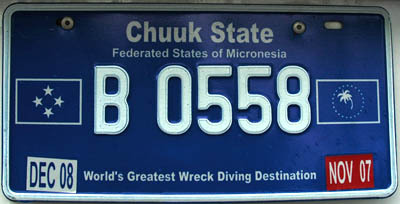 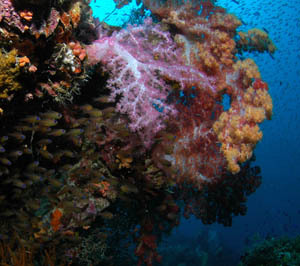 All divers have heard of Truk Lagoon. 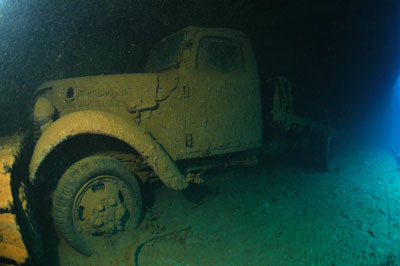 I waited 25 years to make my acquaintance with Truk and ... Oh My! What a bitchin place to dive! 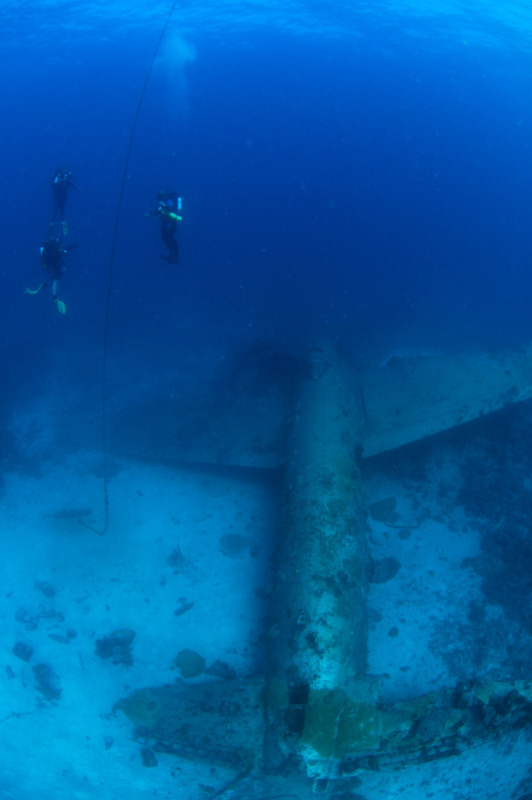 It was a bit a mission to get there, four flights (AKL - BNE - CNS - GUM - TKK) with some long waits in airports, but worth every second. 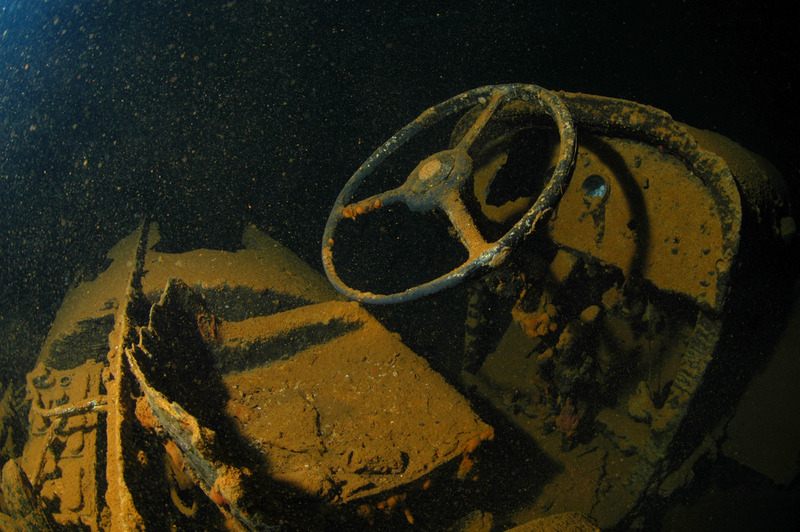 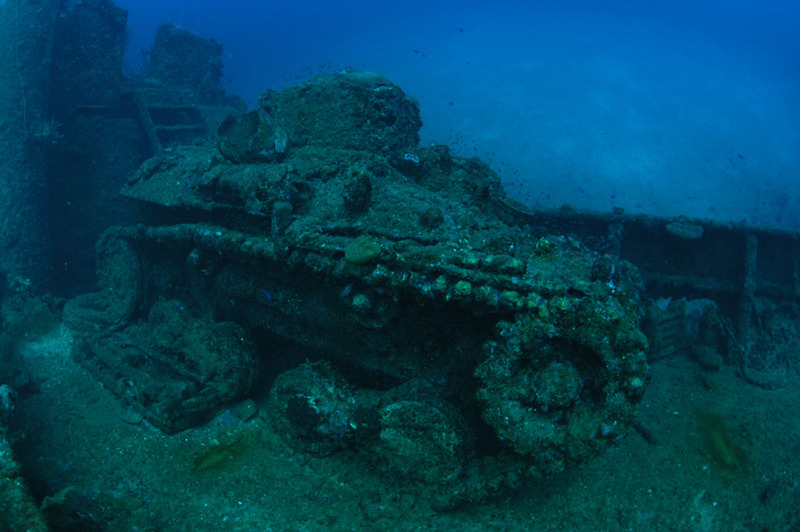 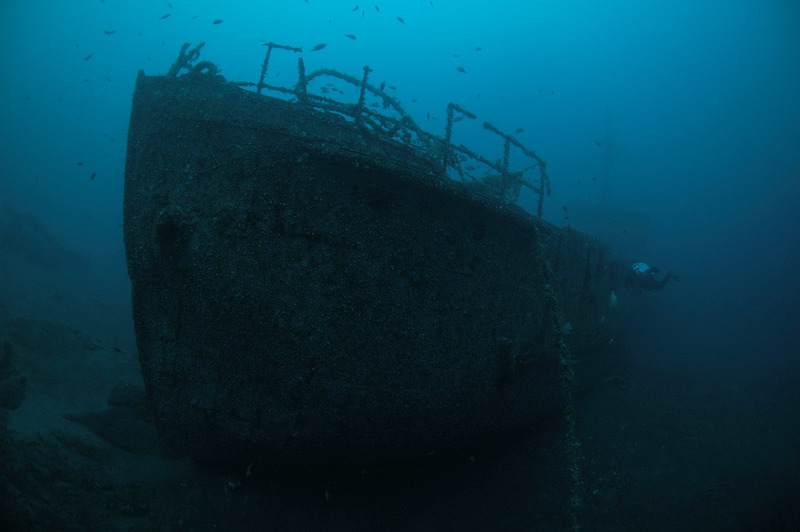 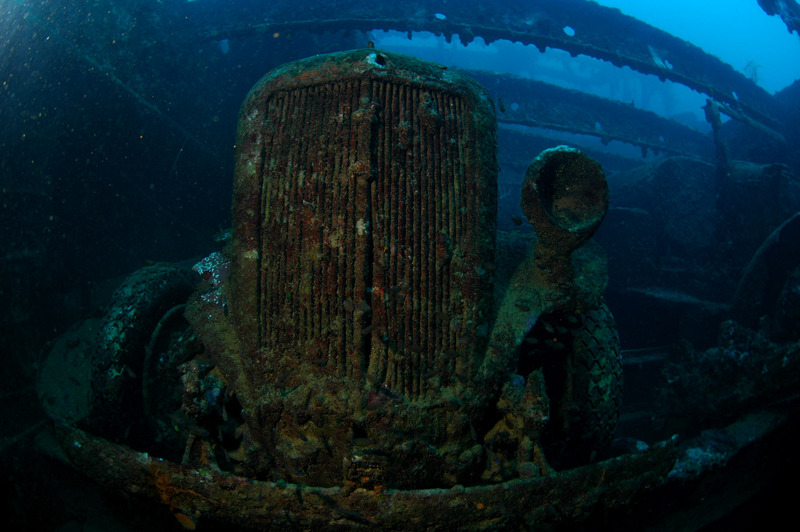 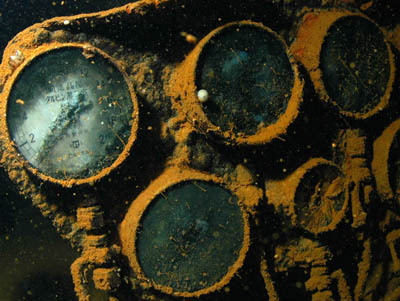 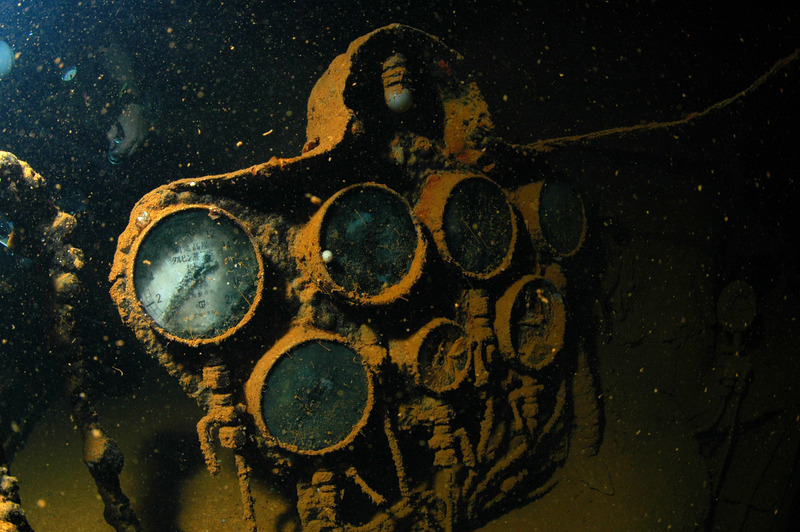 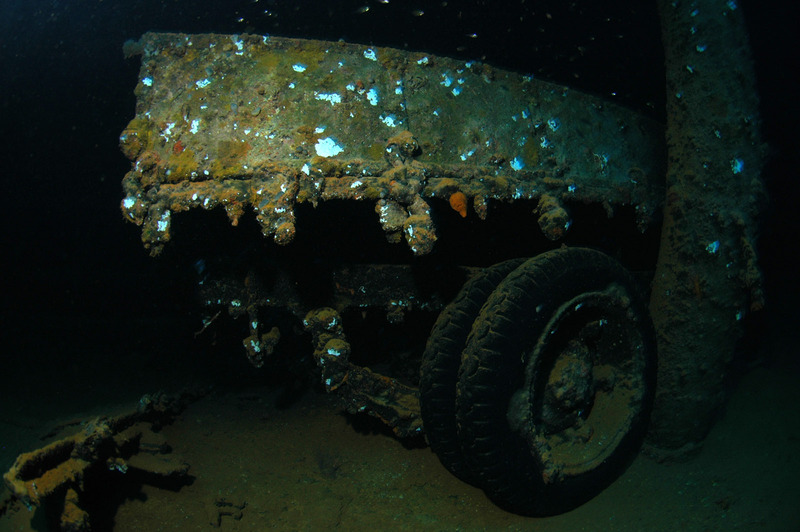 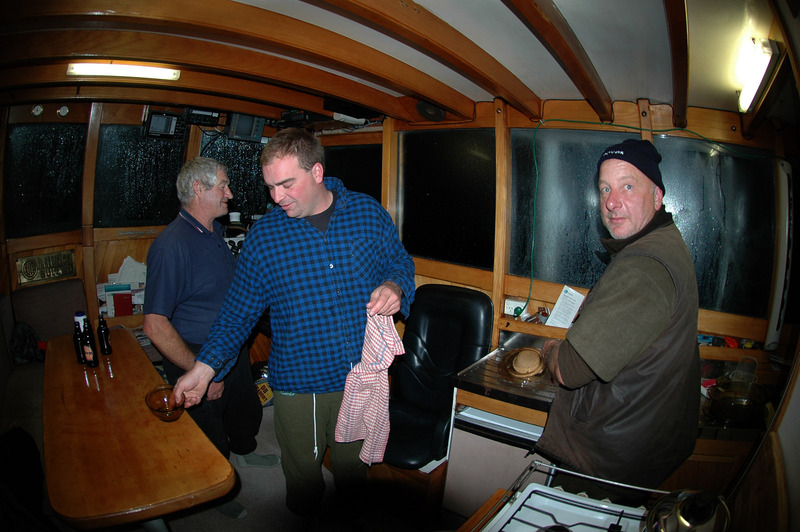 Skip my rubbish photos and cruise to Pete Mesley's site for some awesome photos of the wrecks. 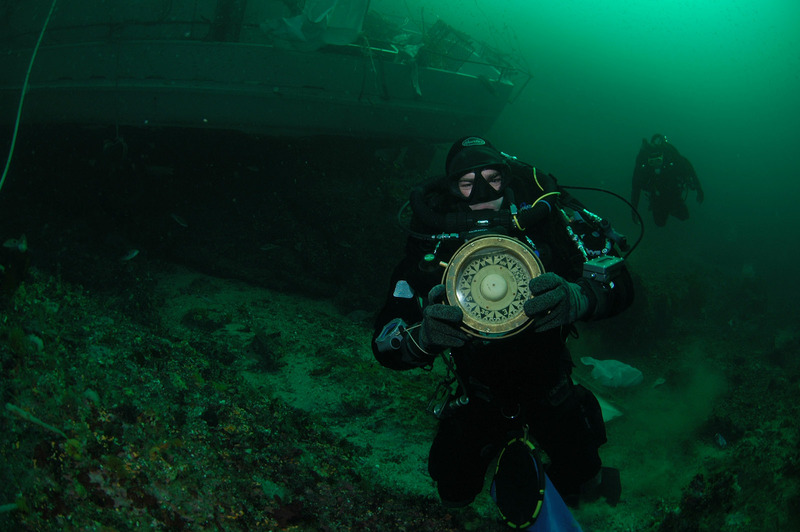 Thanks to Pete for making the rebreather logistics so beautifully simple. 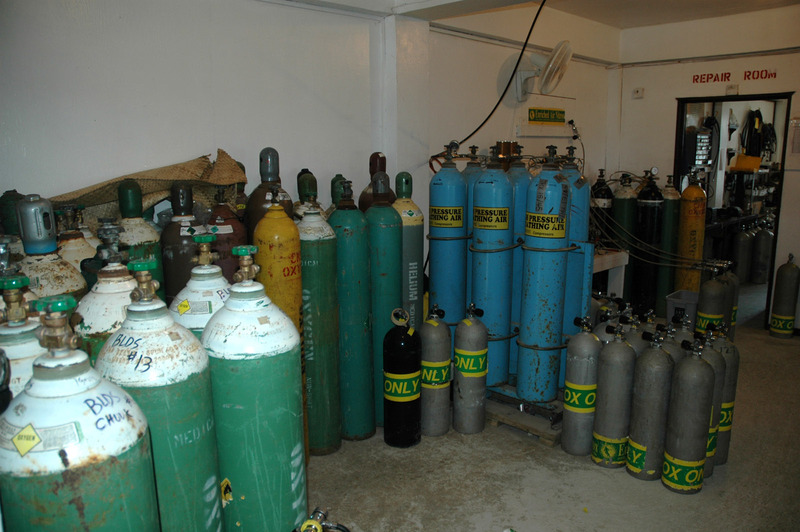 We arrived in Truk to find dozens of 3 litre cylinders, hundreds of kilos of Sofnolime, plentiful oxygen, helium, gas booster and abundant stage cylinders. 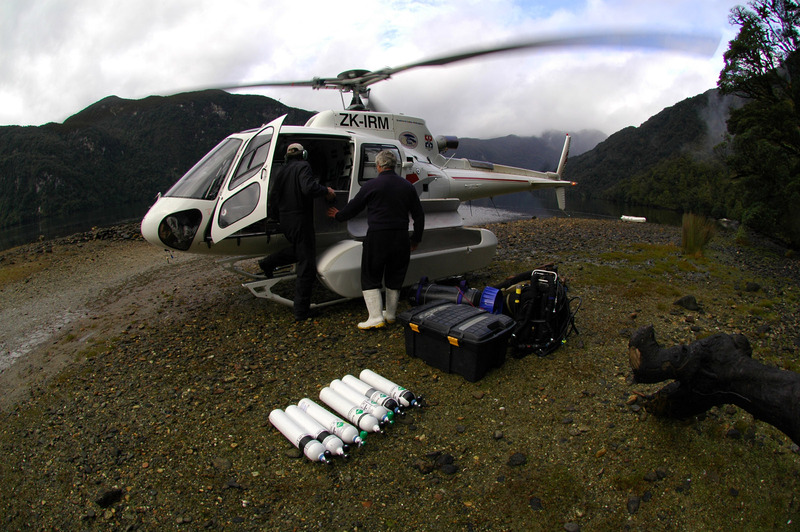 No excess baggage charges - Sweet! 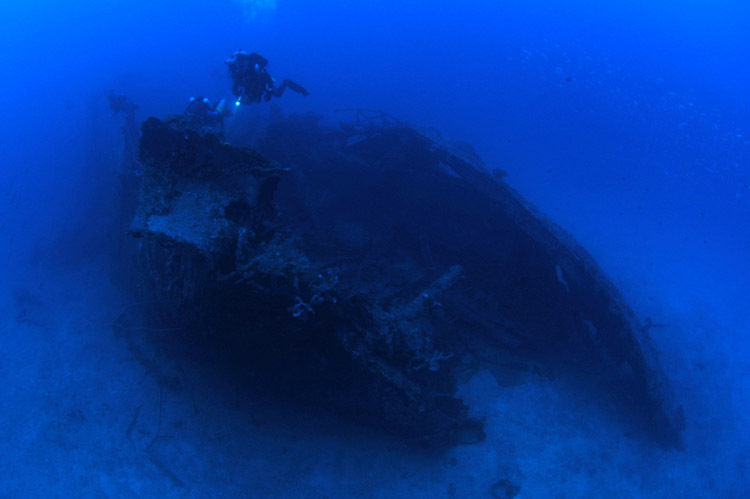 With 29 degree blue at your doostep and more than 50 large wrecks, only one more ingredient is needed for the MEGA dive trip . . . . . . . . . . . . . . . . you guessed it . . . . . . . . . . . . . cold beer! San Francisco Maru. 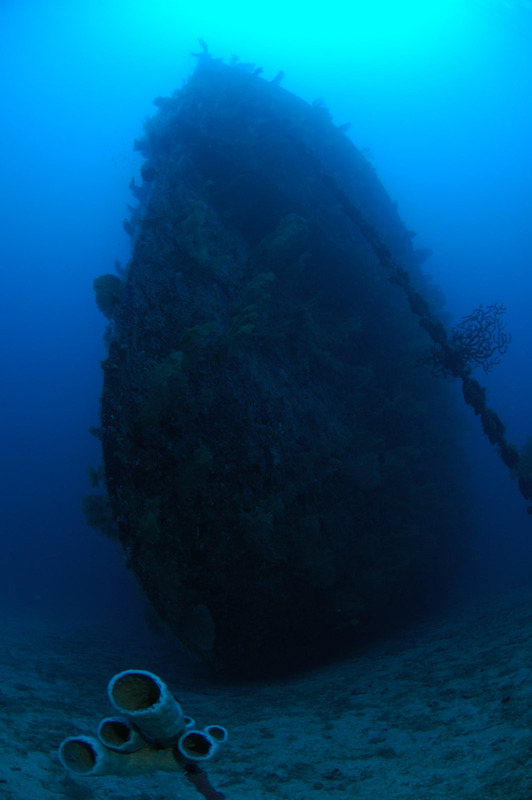 48 metres on the deck, 52 in the upper part of cargo holds and 61 metres on the sand at the bow. 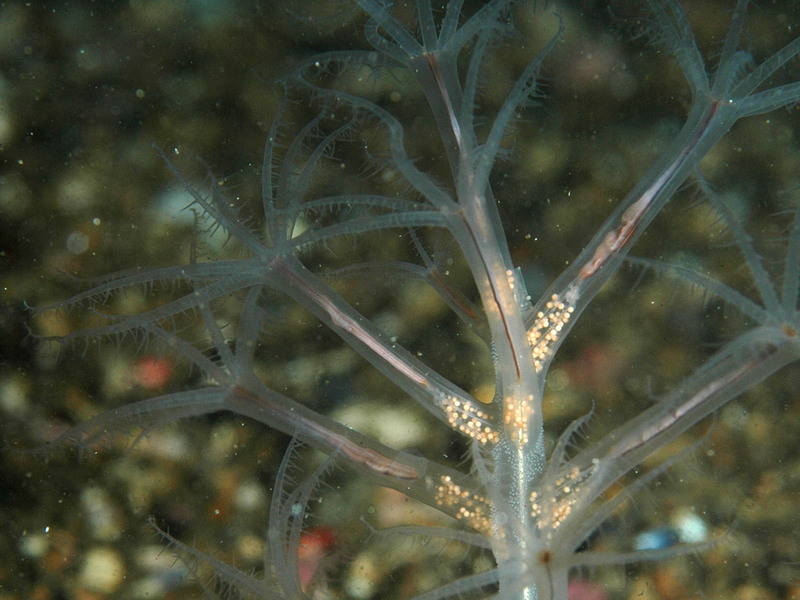 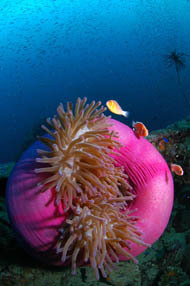 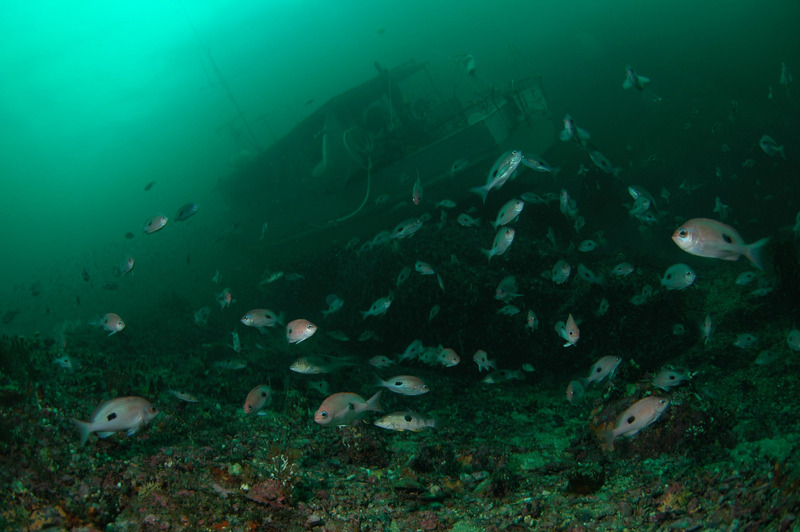 The Shinkoku Maru is absolutely crawling with marine life. Real wreckies have been known to complain (seriously!) that there's so marine life that it gets in the way of the rust. 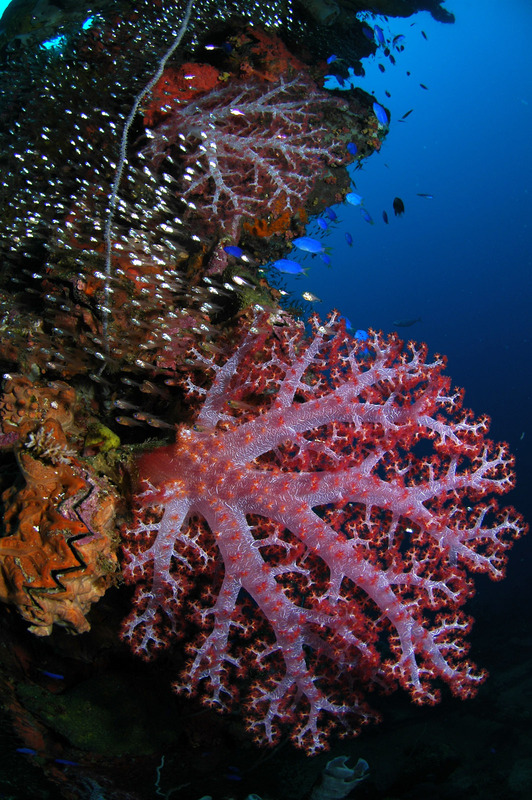 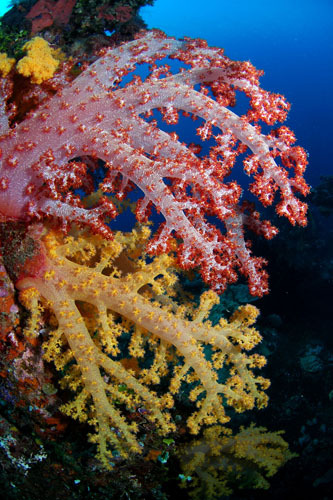 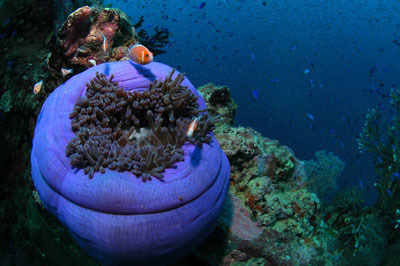 This really makes me laugh because I can't understand how you couldn't love all these beautiful corals and fish. One day, maybe I'll be a real wreckie and I'll understand. 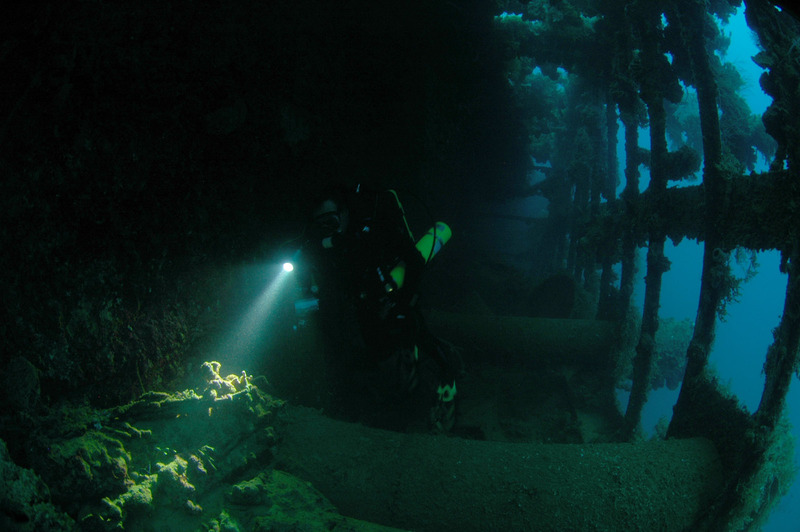 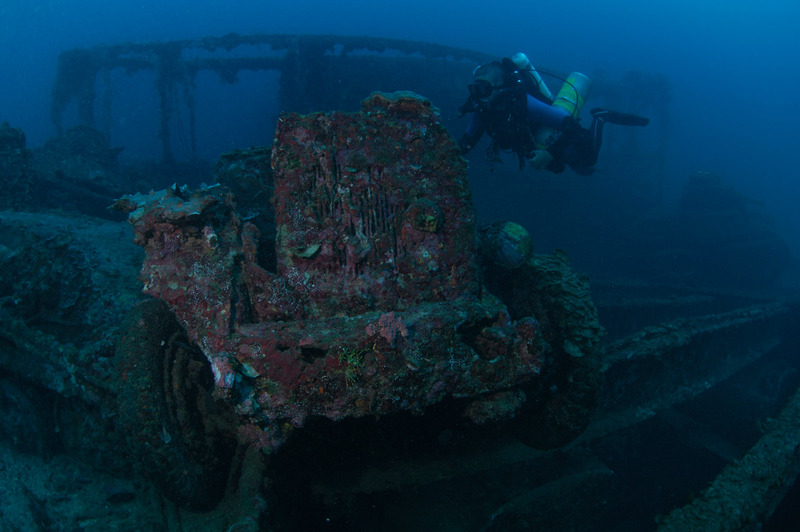 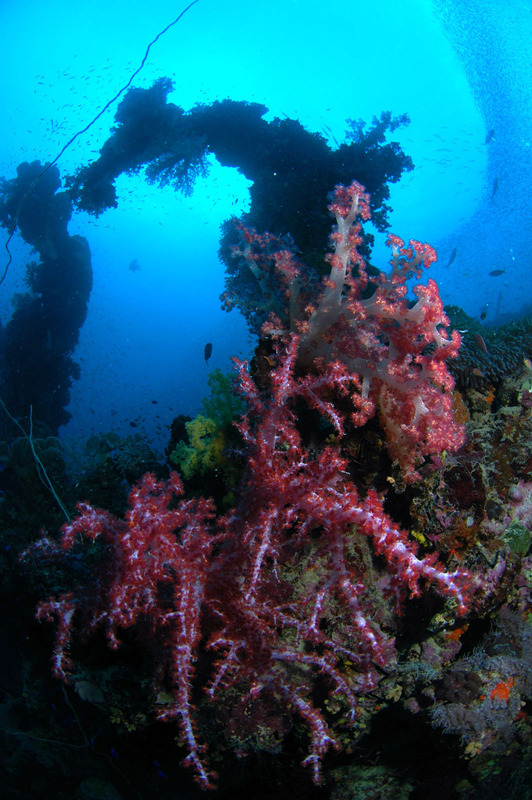 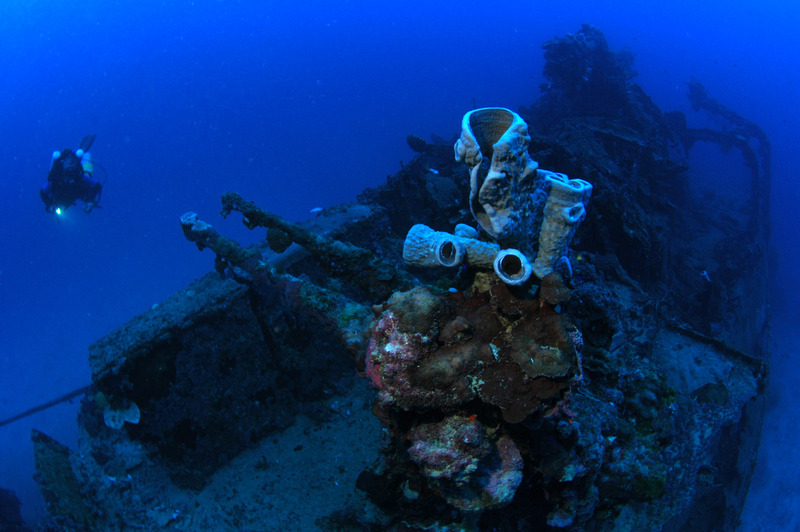 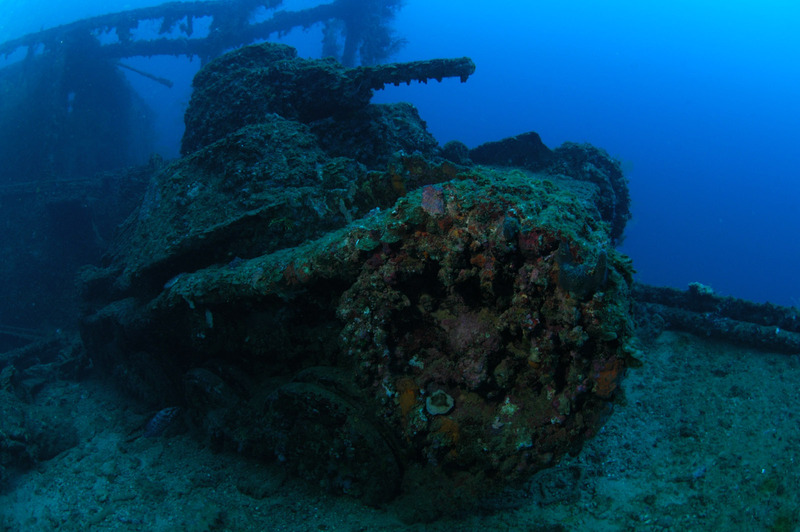 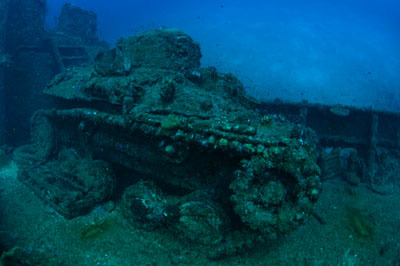 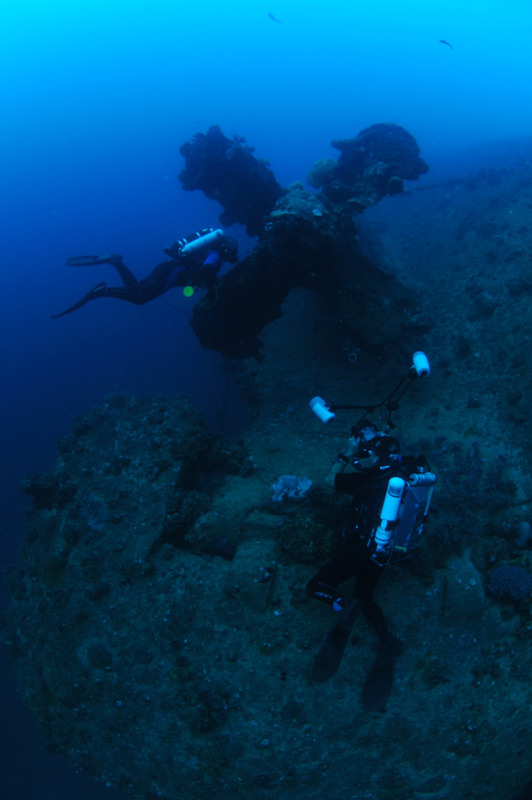 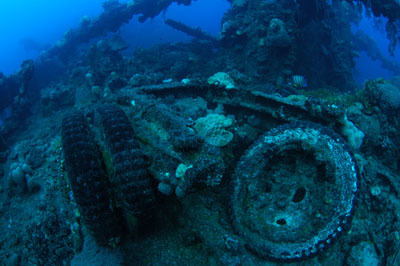 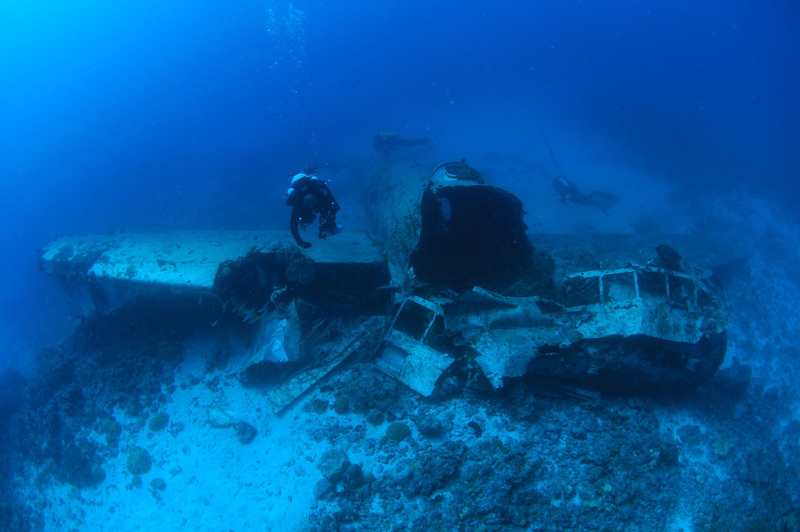 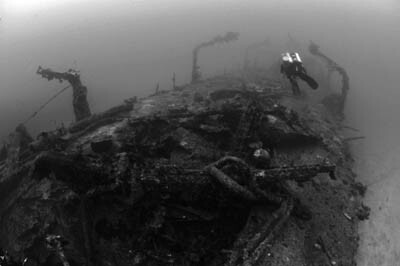 My favourite Truk dive, the wreck of IJN Destroyer Oite. 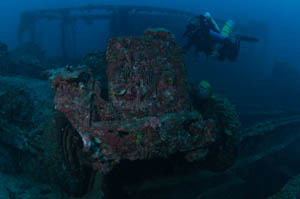 I'm showing my lack of wreckie credentials, because these destroyers are relatively small, narrow beam vessels with limited opportunity to penetrate and get down down and dirty in rust. 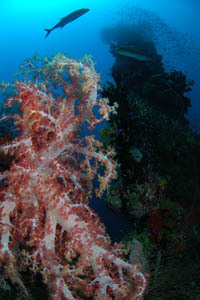 I loved the deep blue water and that this wreck is distant from, and much less dived than other Truk wrecks. 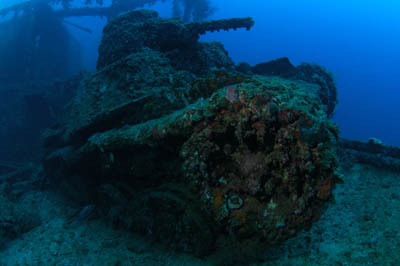 Oite, a Kamikaze Class Destroyer suffered a devastating torpedo hit on 18 February 1944, broke in two and sank immediately in 63 metres of water. 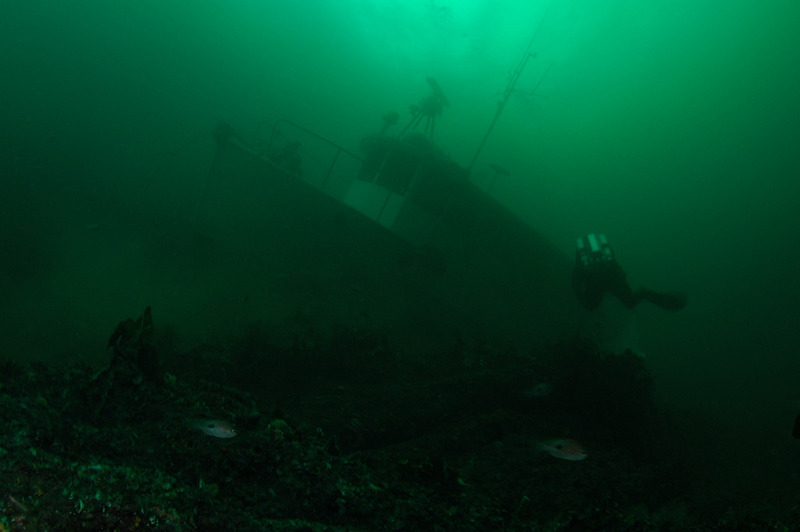 In the photo, Damián (ES) and Rob (AU) swim over the rear of the vessel which is resting almost upright on the sand. The bow section lies upside down, about 20 metres away. 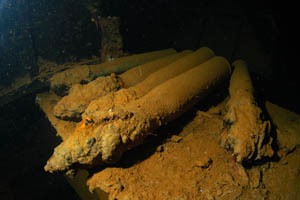 Oite's AA guns towards stern. 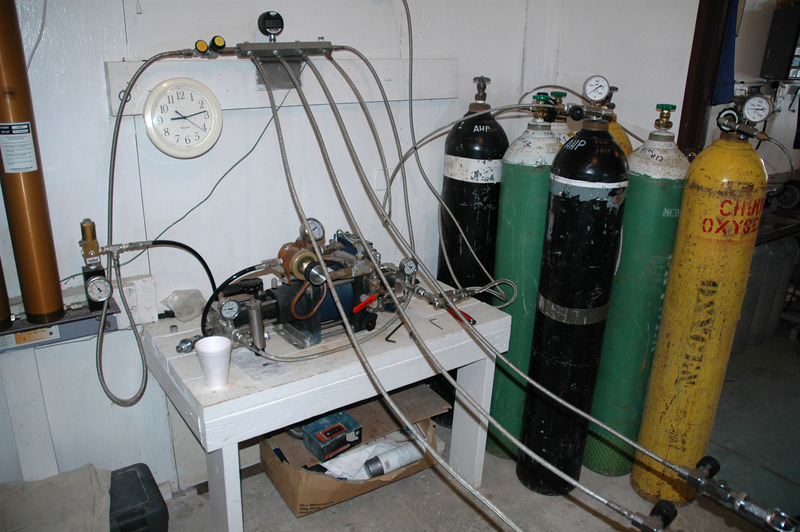 Plentiful oxygen, helium and a lurvley big gas booster at the Blue Lagoon Dive Shop. 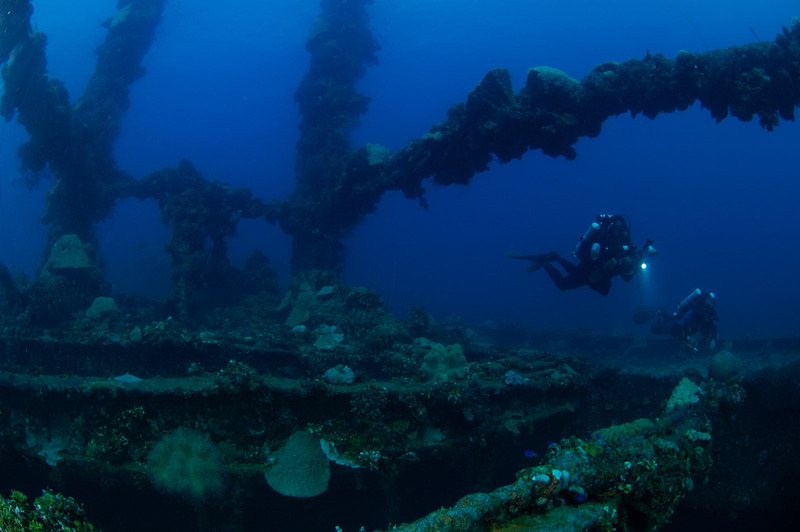 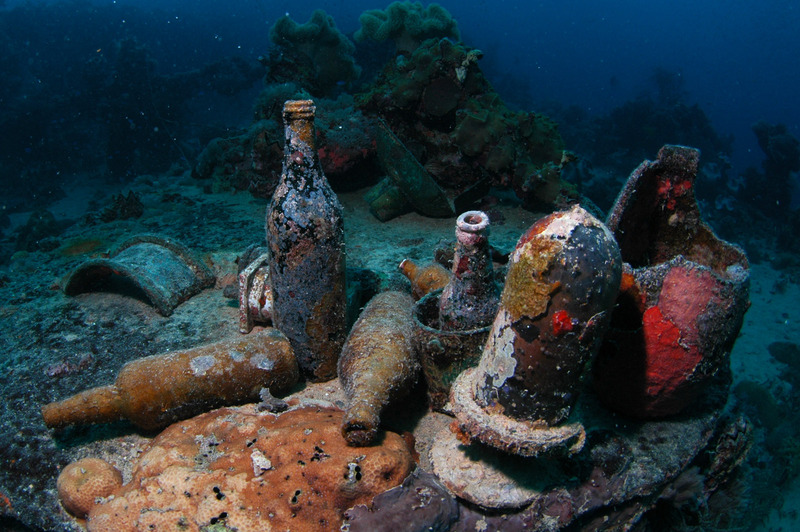 WORLD'S GREATEST WRECK DIVING DESTINATION. 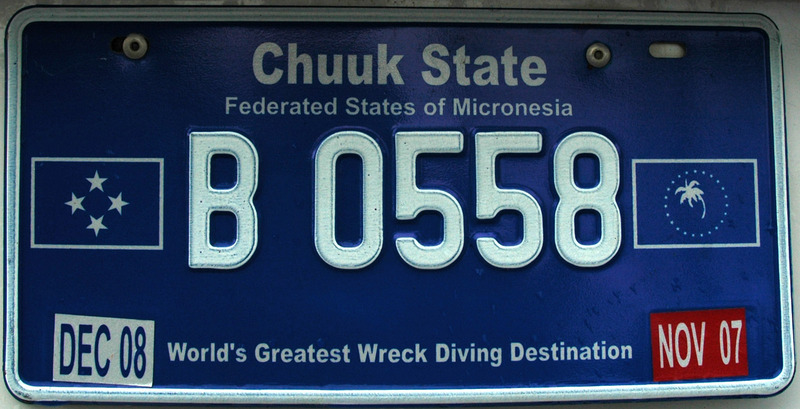 It says so on their car registration plates so it must be true. I don't need any convincing. 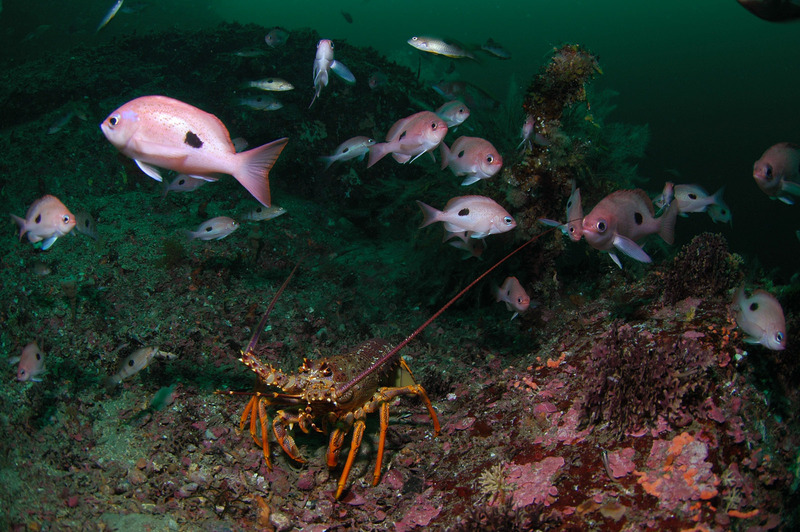 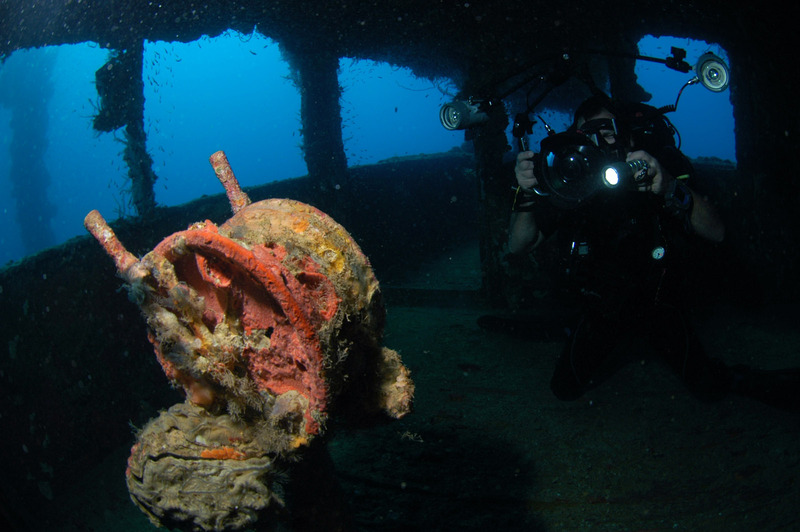 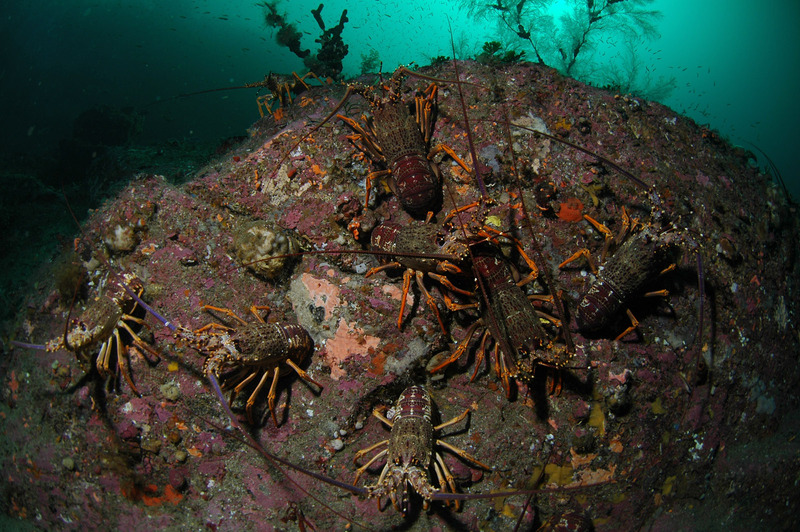 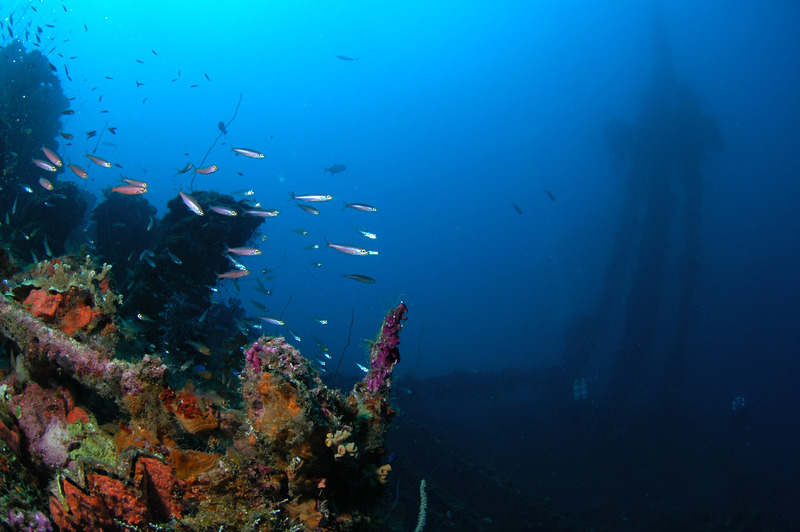 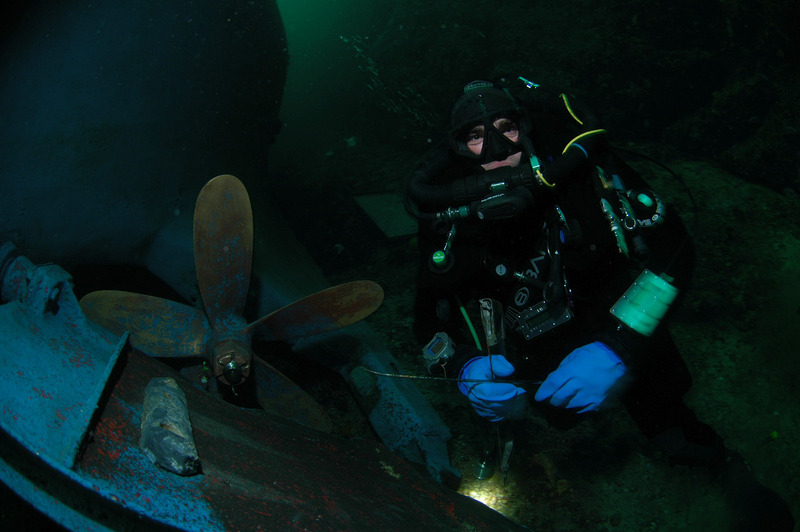 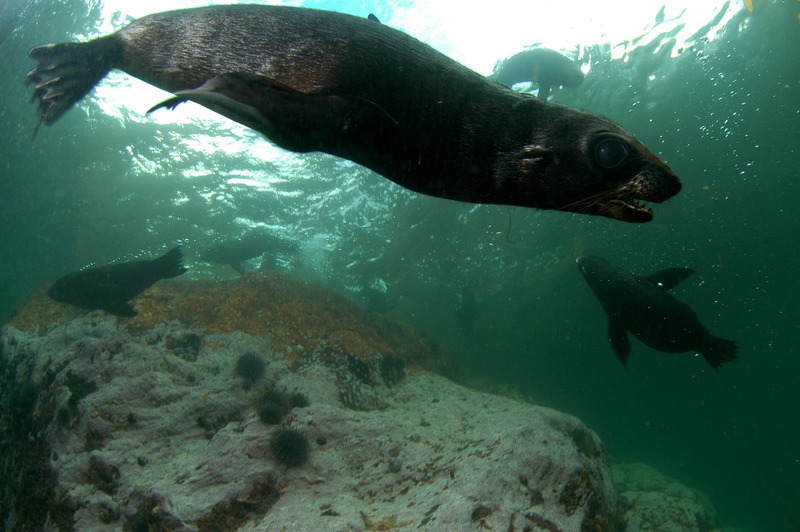 Wreck diving can't get much better than this. 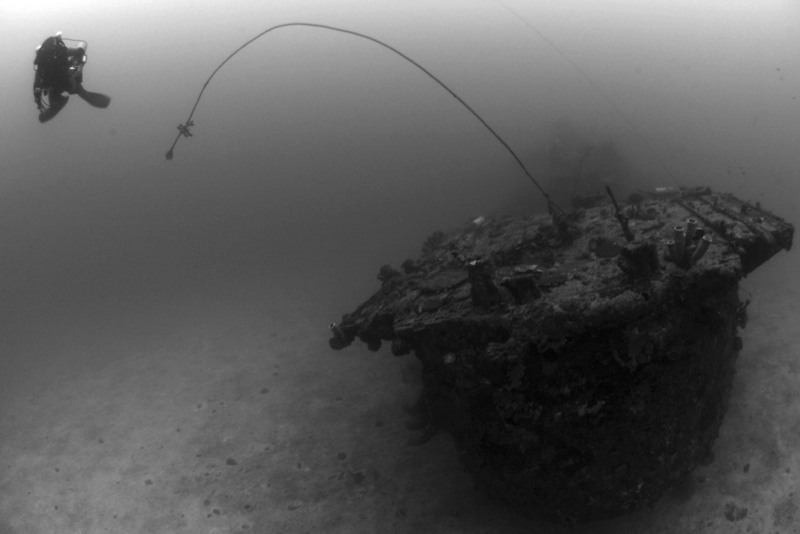 Still . . . there's a place called Bikini which needs checking out.